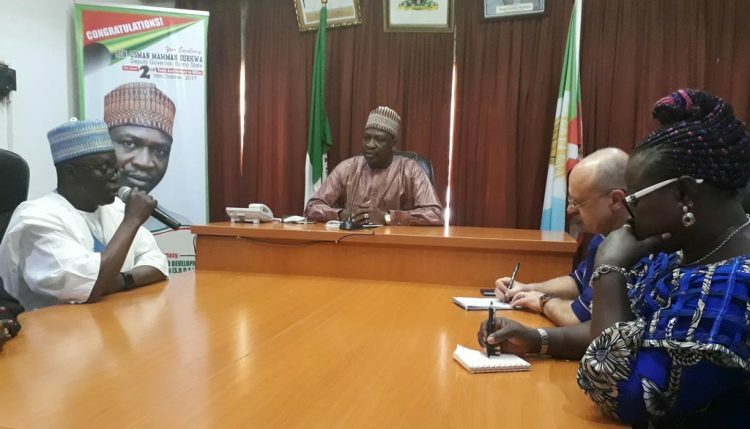 Ahead of the Nigeria Zero Hunger Forum (NZHF) meeting scheduled for March 2018, Kenton Dashiell, IITA Deputy Director General for Partnership for Delivery, led members of the NZHF secretariat to Borno State to assess the preparedness of the northeastern state towards hosting members of the NZHF. The mission, from 12 to 15 February, was also aimed at providing technical backstopping and advising the Borno team on areas that would make the meeting in March a success. Dr Kenton Dashiell and party being received by the Deputy Governor of Borno State and taken on a tour of surroundings. Dashiell and members of the NZHF secretariat paid a courtesy visit to the Deputy Governor of Borno State, Alhaji Maman Usman. The team was well received, and the Deputy Governor reiterated the commitment of the State to Zero Hunger. He also commended IITA for the donation of seeds to the State. Dashiell informed the Deputy Governor that one of the reasons for the visit was to ensure the participation of other ministries that may have influence on the goal of Zero Hunger. Dashiell, who chairs the NZHF secretariat at IITA, interacted with the Commissioner of Agriculture, Alhaji Muhamed Dali and members of the agriculture ministry. He also met with the Commissioner of Poverty Alleviation, Mrs Inna Galadima; Commissioner of Rehabilitation, Resettlement, and Reconstruction, Prof Babagana Umara; Commissioner of Livestock and Fisheries, and representatives of the Ministry of Health. The team thereafter made a field tour to the state-owned screen house (about 5 ha) for the production of tomato, and the mechanization section of the Ministry of Agriculture, which houses brand new tractors, harvesters, and planters, etc. A trip was also made to an irrigation-accessories plant and a greenhouse which produces seedlings. At the end of the field tour and the interactions, Dashiell expressed confidence over the preparedness of the State. Besides interacting with state officials, Dashiell also met with the Food and Agriculture Organization (FAO) in Borno. The meeting was aimed at further strengthening cooperation with IITA. The DDG was received by Nourou Tall, FAO Representative Head in Borno State. Both organizations discussed areas of collaboration and agreed to build on previous efforts. Dashiell was accompanied by David Oluwadare, Toyin Oke, and Godwin Atser.